A caravan park, which has been at the centre of a planning row in the Brecon Beacons national park, is up for sale. Gilestone Farm, near Brecon, which comprises of a campsite and 236 acres of land, is on the market for £2.5m. In January, a High Court judge quashed planning permission for the site, originally awarded in 2005, following a long-running dispute. Solicitors acting for the owners of Gilestone farm, in Talybont on Usk, have been asked for a comment. 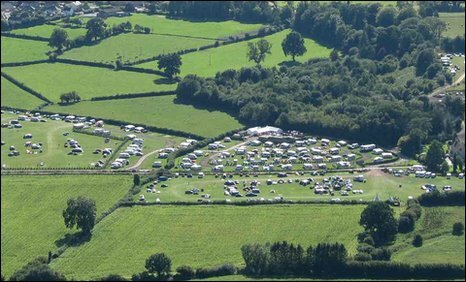 The campsite received planning permission to build its camping and caravan park in 2005, but since then it has been the subject of controversy. An inquiry in 2007 found "serious failings" in the way Brecon Beacons National Park handled the situation. Eventually, the issue went before a High Court judge in January. At the time, the park authority said the case was brought by Usk Valley Conservation Group against the national park and interested parties - the owners of Gilestone farm. Sitting at Warwick Crown Court, Mr Justice Duncan Ouseley found that planning permission was unlawful. The Gilestone matter is seen to have been damaging to the national park's reputation. It was forced to make changes to its planning department following a wave of criticism and a critical inquiry. Papers from the inquiry were handed to Dyfed-Powys Police in 2008 to establish any pattern of wrong-doing. Meanwhile, the Welsh Assembly Government appointed a so-called "critical friend" to advise the park on planning issues. Since then, it has been praised for the "significant improvements" it has made, but told that "big challenges" remain.